E-reader makers have reason to fear such innovation because people will be able to buy devices with more functions for about the same price. The latest Kindle, a stand-alone e-reader, costs $359 according to Amazon.com, while some of the world’s most popular netbooks with 10-inch screens, Asustek’s Eee PC 1000HE and Acer's Aspire One AOD150-1165, are similarly priced. 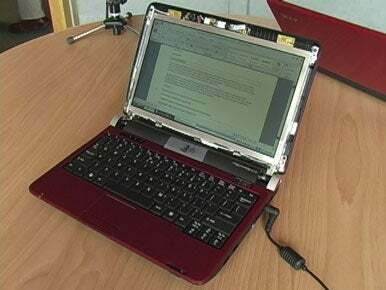 A netbook with prototype Pixel Qi “3Qi” screen (Martyn Williams, IDG News Service). But that’s about the only benefit from this recession.